At last: I’m learning to row. When I was seven, my family rented a cottage on a small lake, with a rowboat the kids could use. As the youngest, I had to fight to sit in it, much less row it. Then one late afternoon, I found the boat abandoned. I climbed in, gripped the oars, and rowed out onto the lake. I still remember how good it felt to be alone, gliding over the deep mystery of water, with no one telling me what to do. I think that’s why I’ve always felt a little stab of envy when I walked the Stanley Park seawall and saw the single scull rowers in Coal Harbour. 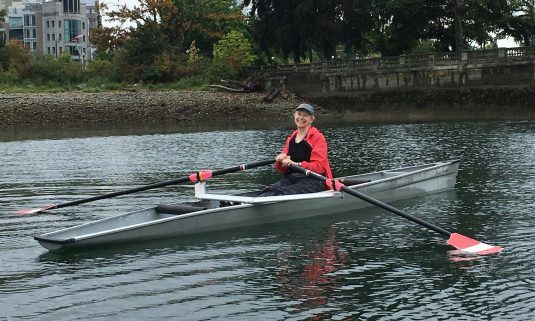 I kept telling myself that I would learn to row, “someday.” Now that I live within walking distance of the Vancouver Rowing Club, it’s hard to imagine a more appropriate “someday” than now. I’ve had two lessons, and the third is coming soon. So far it’s, wildly technical, deeply satisfying, and a neural-pathway-building exercise on a massive scale. I’m always grateful for the role that yoga has played in my life. But here’s what makes me especially grateful to my practice right now: so far at least, learning to row isn’t physically challenging. I swim a little, walk more than I swim, and ride my bike around the seawall when the weather’s good. Apart from my practice, that’s it for working out. But I can lift my end of the boat from the rack, carry it overhead to the water, and lower it in. I can get in and out of the boat – I’m awkward, but never out of balance. I can reach over and release the water-side oarlock, a precarious stretch with one foot in the boat, one hand stabilizing the oars, and the other arm reaching out to the latch. The stroke practice we’ve done so far is never physically demanding, just a mind-bending task of learning new skills. Best of all, I have no fear that my body will fail me. Learning to row is an adventure, not a struggle. I don’t know if I’ll still be rowing a year from now, or if I’ll try it out and let it go. But I do know that without my yoga practice, it would be a completely different and much less happy experience. And that makes me even more determined to preserve and deepen my practice as years go by. Next week I’ll be going back to class, with my teacher, Ingelise Nherlan. Going to Ingelise’s classes immerses me in a flow of creativity and inspiration for my home practice. It keeps me in touch with the poses I’d rather avoid, and it deepens my understanding of the poses that are better than chocolate. More than that, it gives my practice week a focus. I hope that if you’re reading this from anywhere yoga is taught that you’ll be headed back to class too. If you live in Vancouver, and would like to take classes with me, you can find my schedule at http://www.yogaon7th.com/eve. Congratulations on writing such a nice piece of work. It has inspired me to try something new myself. I was always afraid that I might mess up things, but you have given me confidence. Thank you for sharing your life experiences. Eve, I’m so glad that your “someday” brought you now to rowing, and I’m honoured to guide you at this point on your watery pathway! Your deep awareness, mindfulness and physical confidence, cultivated in yoga, are certainly contributing to your success here – part of the multitude of benefits that yoga brings to life, always, but especially as we age. Rowing and yoga are close sisters, I’ve found; age slows from time spent on the water in a shell. The physical challenge of moving the boat faster is coming your way soon…but it’s as challenging (and joyful) as you choose to make it! “Close sisters” is a great way to describe rowing and yoga. And I certainly feel younger after we’ve been out for a class. So great to hear of your adventure! This summer my neurosurgeon, showed me that my congenital spine issue is causing some atrophy of my glutes & thighs and recommended that I begin working them in earnest. Although in the winter I may hit the gym, outside is where I’m happiest. 15 years of yoga practice enabled me to take up road biking, clips and spandex and all! Balance, breathing, and an ability to quiet the inner voices that may have otherwise discouraged a 56 year old woman with some disability from taking up a new discipline were honed by my yoga practice. Yeah, I’ve fallen a few times learning the ropes with the clips, and yeah, the outfit is really goofy, but as I whiz along I’m elated by what my body can still do, for however long it can do it! Wow! This spring I got my first bike in more than 40 years and have taken to genteel rides around the seawall. No roads yet, no clips and no spandex. I’m in complete awe at your plunge into biking. Being elated by what your body can do is a great state to be in. Btw, from where I sit, 56 is so young. Thanks for this post. It’s wonderful encouragement. I just started practicing yoga again after a break that was much too long. I think of you often from St. John’s and am grateful for all you taught me while I was living near Yoga on 7th :-) so long ago. I do not row, but rowing is a big thing here in St. John’s. Enjoy your rowing bliss! So great to hear from you. I’ve often thought of you in the past few years and wondered how you are doing. I’m going to assume this comment means you’re just fine. And welcome back to your yoga practice. Good to hear from you! Living in a float home is one of my fantasy lives. Just got a lot more attractive with the idea of being able to row past my own door. There’s something so joyful about being on the water.